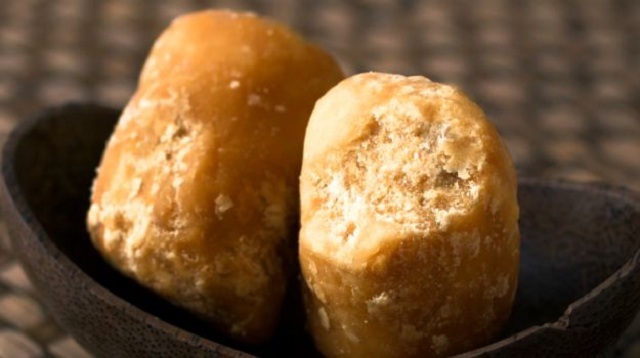 Jaggery, or gur in Hindi, is derived from concentrated raw sugarcane juice and does not look very much attractive. This is the reason why most of the people try to avoid it. 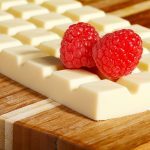 And however, avoiding this sweetener only because of its looks is not your finest decision, this avoidance might reap you some benefits as well. As there is a fair share of Jaggery disadvantages. Jaggery, without any doubt, is preferred over sugar, any time. It does look exact opposite to out sweet and innocent sugar, but why judge something because of how it looks? 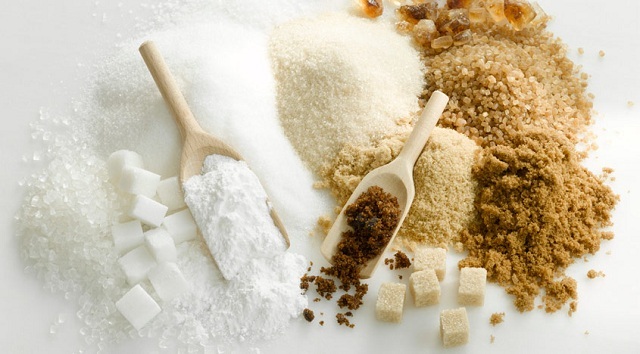 It is, after all, more healthy and nutritious than sugar, mostly because of a few minerals and phytochemicals that are present in it and absent in sugar. However, its blind consumption leads to many disadvantages than advantages and in this post, we will discuss a few jaggery disadvantages. You might gain weight if you are eating lots of Jaggery, specifically lots of unrefined Jaggery for a long period of time. Binge eating jaggery should be avoided because of its high carbohydrates contents. And gaining weight is something which we want to avoid, so this forms one of the major side effects of Jaggery. Another disadvantage of eating Jaggery is that it increases the blood flow from the nose during summers, so it is advised not to eat it in large quantities. It is believed that Jaggery accelerates the swelling in your body if any part of your body is already swollen up. You should avoid jaggery if you suffer from swelling or inflammation. It is one of the Jaggery disadvantages. According to Ayurveda, eating Jaggery and fish together can cause some serious side effects, so avoid eating them together. It is advised not to consume Jaggery if you are a diabetic patient, as Jaggery is a kind of sugar too and increases blood sugar levels. This is a major disadvantage of eating Jaggery. Large-scale consumption of Jaggery can cause parasitic infections in your intestine. So minimize the use of Jaggery if you don’t want to pay a visit to the doctor soon. If you are suffering from ulcerative colitis then don’t consume Jaggery at all. If you are eating freshly prepared Jaggery then that is a major Jaggery disadvantage as it can cause indigestion in the stomach. The calorie content of jaggery is very high, about 10 grams of Jaggery contributes to 38 calories. It contains about 97 percent sugar content and about 98 percent carbohydrates. As far as the other minerals are concerned, it also contains phosphorus, iron, and potassium, which are hardly impressive. It is also to be noted that the nutritional value of this unrefined sugar (Gur) does not satisfy the mineral and vitamin requirements of an individual. Besides this, the label does mention that there are trace amounts of selenium and zinc present in it. Jaggery is derived in colors ranging from dark brown to golden brown and consists of 20% invert sugars, 20% moisture, and 50% sucrose. Do you know about the number of calories in red wine? You can read about the wonderful Jaggery benefits. It is a fact that Jaggery is much better than sugar, but to what range, that is something majority of us don’t know about. Under this title, though, we are going to discuss just that. Jaggery contains natural phytochemicals, which stimulates the digestion and helps in solving digestive problems. Lots of people in India use jaggery with black pepper to increase hunger. This is one of the most important Jaggery benefits. Sugar does not have this type of characteristic. You can use jaggery, ginger, and honey for getting relief from cold, cough and breathing problems. Sugar only worsens such conditions and causes phlegm. This is another advantage of Jaggery over sugar. Both jaggery and sugar do not include many vitamins and minerals, but jaggery still keeps some minerals which make Jaggery, a better competitor. Jaggery is used in traditional Indian medicines for neurological and muscular problems. However, it may not have any medicinal importance, but it is used as the adjuvant with many of the folklore medicines. Sugar does not have any such medicinal importance, which makes Jaggery more advantageous than sugar. If you are suffering from a headache, then jaggery can help you in receiving relief from this. This is one of the many Jaggery benefits. Jaggery contains 3% iron of 10 grams of daily value. It can be used to support additional medicines used for increasing the level of hemoglobin. This is another advantage of adding Jaggery to your diet. Jaggery can also help you to stop hiccups. You can also take it by mixing with ginger juice to get relief from hiccup, nasal congestion, breathing troubles, and chest tightness. This is another wonderful Jaggery benefit. Jaggery is used to control blood pressure. Sugar does not have this quality. 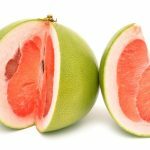 Pomelo fruit also controls blood pressure. One of the many benefits of consuming Jaggery is that it also helps to reduce gas, bloating and flatulence. It is believed by many people that Jaggery is the sugar you can turn to when you are diabetic and cannot eat the table sugar. But if you think that Jaggery is your angel in disguise then think again! Without any doubt Jaggery is nutritious than sugar, it contains many vital minerals which sugar lacks, such as iron and calcium. So, naturally Jaggery is healthier but when it comes to diabetes then any kind of sugar is harmful and Jaggery is essentially a sugar. 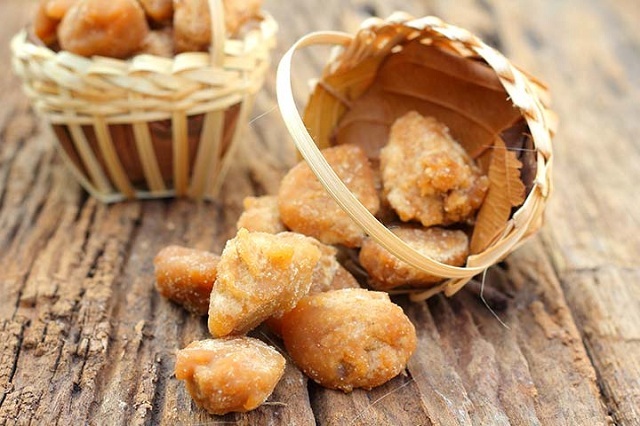 It contains carbohydrates; just like sugar contains carbohydrates, so it is not easily metabolized which increases the blood sugar level, and this forms one of the most important Jaggery disadvantages. The glycemic content of Jaggery is very high, and if you are diagnosed with diabetes then your diet has to contain food which is low in Glycemic content. So, if you are planning to introduce Jaggery as a sugar substitute then know that Jaggery diabetes is an issue too. Many people believe that replacing white sugar with jaggery can help them to control their blood sugar level, but this is a myth. The reason lies in the fact that, although complex, it still consists of a long form of sucrose. The diet of a diabetic person should be very low in the Glycemic index, hence jaggery is not at an option for them. Every eatable has both advantages and disadvantages. They should only be consumed after knowing the pros and cons of them. However, moderate consumption of any food leads to amazing benefits that you cannot even fathom and same is the case with Jaggery. We cannot see beyond the advantages of jaggery. They are many. Jaggery is considered a blood-purifying food while increasing the level of hemoglobin in the blood. It is a rich source of iron and it can prevent anemia and provides energy to fight weakness and fatigue. Other minerals included in Jaggery are selenium and zinc that prevent radical damage and boost immunity. Jaggery can be healthy for the skin, with its skin nourishing properties. Jaggery is known for its role in keeping digestion healthy. The digestive enzyme is stimulated by consumption of Jaggery for speedy digestion. Metabolism is also improved by jaggery consumption, as it has contents of potassium that maintains electrolyte balance which enhance metabolism. Jaggery also has high contents of iron. Jaggery tea prevents from water retention, migraine, bloating and cough and cold. 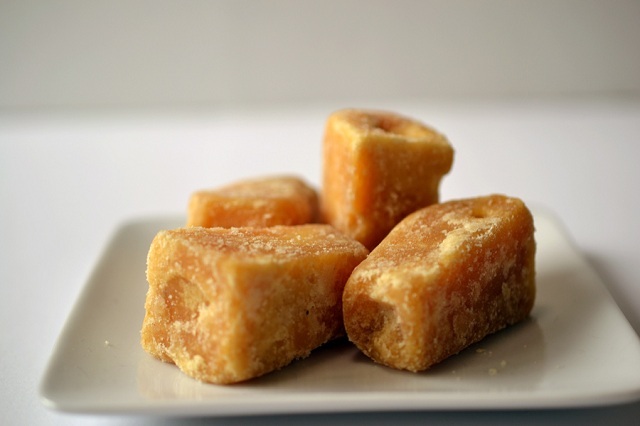 Eating jaggery creates endorphins hormones in the body, which are mood lifters. It also strengthens the bones and muscles. Joint pains can be treated with jaggery consumption. These are both disadvantages and advantages of Jaggery. The results that you are reaping is the result of how you consumed it.